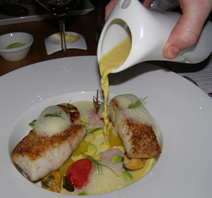 I had dinner at Aquavit Grill & Raw Bar in May 2008 and had the opportunity to sit with Chef Martin Brag and learn more about this talented chef. Hailing from West Sweden, Chef Martin Brag grew up around great food, and was inspired to cook by his mother who is very good at cooking old Swedish dishes, and also from his grandmother. His family had a vegetable garden and he learned to appreciate fresh ingredients. When he was 20 years old, he went to train with Chef Marcus Samuelsson at Aquavit in New York and was the youngest Swede to ever work at the restaurant. From New York, he moved to Sydney, Australia where he continued to hone his culinary skills working with the illustrious Chef Neil Perry at the Rockpool. Returning to Sweden, he worked at the Michelin-star restaurant Bon Lloc with Chef/Owner Mathias Dahlgren until the restaurant closed, and joined Aquavit Grill & Raw Bar when the restaurant opened in February 2008. Chef Martin explained that the focus of Aquavit Grill & Raw Bar is to keep it as simple as possible, with not too much on the plate. 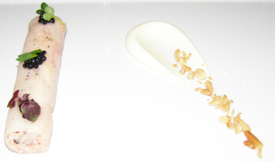 The 3-course menu perfectly illustrates simplicity with elaborate flavor. Method: Slice and roast the shiitake mushrooms. Chop the lobster meat and mix with the shiitake mushrooms, mint, cilantro, and aioli. Season to taste with salt and pepper. Thinly slice the pears and marinate them in the 1,2,3 liquid for 30 minutes. Remove them and pat dry. Place the pears in two rows on plastic wrap. Make a line of the lobster salad down the middle of the pears, and fold the pears to make rolls. Method: Bring all ingredients to a boil in a pan. Remove from heat, and let cool. Strain and freeze. With a fork, scrape the frozen granite to a snow-like texture. Put the "snow" in a glass and pour 2 cl (0.6 ounce) Absolut Citron in each glass and stir. Presentation: Place the lobster roll on a plate, garnish with avruga caviar and herbs, and pour some aioli and chopped almonds on the side. Serve with the Ginger Ale Granité. Method: Wash the mussels; cook with garlic and shallots in white wine. Remove the mussels from the broth when they have opened. Reduce the mussel stock and add crown dill and saffron. Finish with heavy cream and season to taste with salt and pepper. Strain. Dice the potatoes and cook them in the broth. Slice the cucumber lengthwise with a vegetable peeler and season with dill and salt. Sear the fish and the scallops, and remove the mussels from the shells. Cook the shrimp in the mussel broth. Presentation: Place the potatoes and cucumber in a deep bowl, top with the fish and, shrimp, and scallops. Garnish with the tomatoes, soybeans, and dill. Pour the broth around the seafood. Method: Slice one stalk of rhubarb lengthwise with a peeler to create long strips. Put the strips in a pan. Cut the remaining rhubarb into small julienne "sticks." In a pan, bring water, sugar, and lemon juice, and vanilla bean to a boil; pour over the sticks and place them in an oven to cook until they are "al dente." Use the same liquid to cook the rhubarb strips. Place a couple of sticks on the rhubarb strip and roll. Method: Melt the butter and chocolate. Whip the eggs, yolks, and sugar together. Stir the chocolate and mix with the egg mixture. Add the rest of the ingredients and stir carefully. Pour into coffee cups. Bake in a 160 °C oven (320 °F) for 5 minutes. Method: Dissolve the gelatin in water. Mix the coconut puree, heavy cream, and sugar together. Heat the liquid and add gelatin. Place in a siphon. Presentation: Press the siphon to create foam on the hot chocolate, and garnish with roasted coconut. Method: Dissolve the gelatin in water and set aside. Mix the rest of the ingredients and then add to the gelatin and mix. Place in an ice cream maker and process. Read about Aquavit Grill & Raw Bar in the Restaurants and Chefs' Recipes sections where Chef Martin Brag shares a few of his recipes in Swedish.